Teamwork. 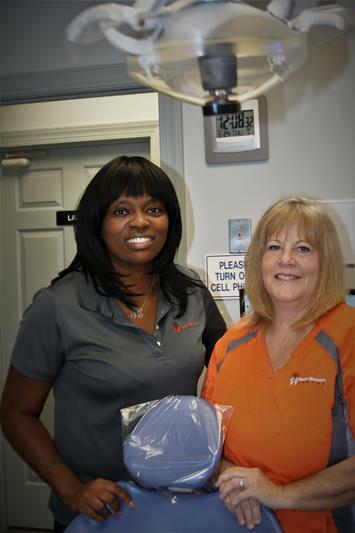 That is what sets Peach Blossom Dental – the office of Angela Wright, DDS – apart from other dental offices. Our team is passionate about listening to you, educating you on your best possible options, and giving you the best care possible. At Peach Blossom Dental, we value long-term patient relationships, and make it a priority to treat our patients like family so that they keep coming back. We understand that we are here to serve your needs. That is why we continually innovate and upgrade our services to provide the most comprehensive level of care possible. We offer Family, Cosmetic and Restorative Dentistry in a friendly and comfortable environment. We offer a “no surprises” payment policy. You will know all the costs upfront before any work is done. We offer multiple payment options to give you flexibility. We gladly accept and file insurance to help you maximize your benefits. We only use the highest quality materials that are Made in America.